Send in balloons. 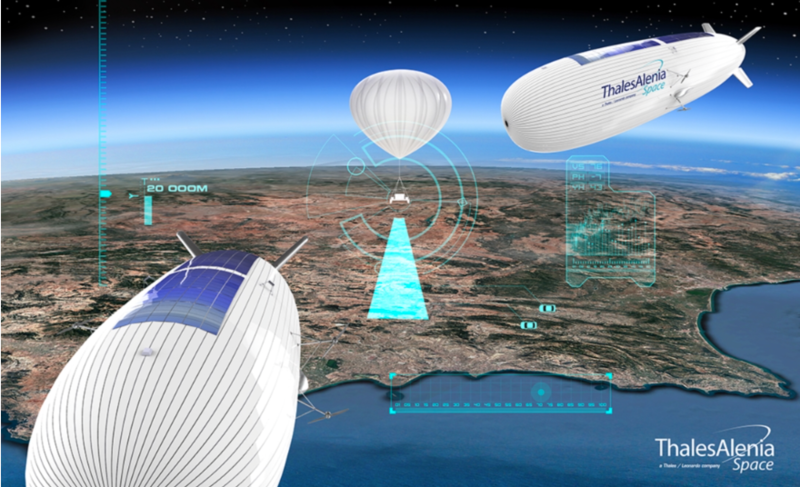 That's what Hispasat, the Spanish satellite communications operator, and Thales Alenia Space, the joint venture between Thales (67 percent) and Leonardo (33 percent), are jointly doing to prepare a stratospheric balloon demonstration for 4G/5G telecom applications. The test flight is scheduled for October 2018 in southern Spain, the demonstration will test 4G/5G applications by allowing direct communications between smartphones and a High-Altitude Pseudo Satellite (HAPS) – or is this case, a stratospheric balloon. Hispasat CEO Carlos Espinós stated that reflecting their ongoing policy of developing innovative solutions to address their customers' needs, they are continuing to study the vast possibilities offered by stratospheric platforms as a complement to geostationary satellites. Stratospheric solutions offer greater operational flexibility and agility, enabling them to immediately meet communications and connectivity needs with an infrastructure that provides a huge broadband with a minimum delay, while avoiding all technical and economical limitations derived from a rocket launch. Moreover, this solution entails a smaller environmental footprint than satellites, which is an additional advantage. They take a keen interest in the solution offered by Thales Alenia Space, and it’s ideas like this that keep us at the forefront of space. They are delighted to collaborate with their long-standing partner on such a promising project. Jean Loic Galle, CEO of Thales Alenia Space, added that Thales Alenia Space is taking an incremental approach to this program with Hispasat. They are proud to have earned Hispasat’s trust in Thales dedicated HAPS solution, namely Stratobus™ — a stratospheric airship that combines the best of drones and satellites to provide a low-cost system that offers autonomous operation and permanent regional coverage, while offering an excellent fit with satellite systems. Stratobus™ is designed for a wide range of civil or military applications, including telecommunications, navigation and surveillance. Its position in the stratosphere at an attitude of 20 kilometers is optimal for 4G and 5G telecommunications, with signals sent directly to the end-user’s smartphone in just milliseconds.